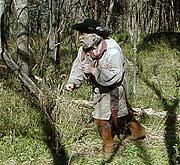 Of all the skills of the early frontiersman, few have the romance attached that throwing the tomahawk does. We've all seen it done with aplomb in various movies and TV shows, and it is made to seem a deadly, frequently used skill. That's probably mostly modern day imagination, because few recorded accounts of its being done in combat have come down to us. When you think of it, who would want to throw away a perfectly good weapon? We will probably never know the truth about it, but that shouldn't prevent our having a lot of fun with it. It certainly is a favorite pastime at most rendezvous, and will continue to be. It's an impressive thing to watch when you first are exposed to it, but, like many other things, it's not as difficult as it seems. With a little knowledge and a few hours of practice, even fairly small children get quite good at it. Let's discuss what I consider the basics so you can get to practicing. Not all tomahawks are created equal, and there is no doubt some of them are very difficult to throw well because of the way they are made. 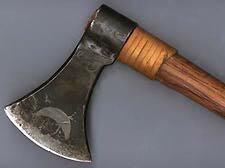 The ideal tomahawk for throwing should not be very heavy, about 1 1/4 to 1 1/2 pounds is about right. You can throw one of that size for a long time without tiring, and it also will allow you to have better control. Length is important, too, very important. Most tomahawks come with a handle which is too long. Because of the physics involved, there is an easy way to find a proper length for you. Make a fist. Measure from your knuckles to the tip of your elbow. That length should be the overall length of your hawk, including the head. 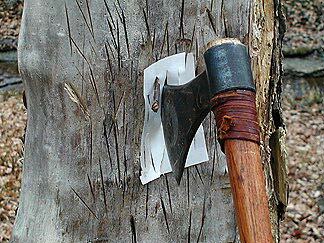 A simple tomahawk is best, and ones with complicated configurations may not throw well. My favorite is the 'squaw axe' shown at left. Notice that it is shaped so that the leading edge sticks forward a bit, making for good sticking qualities. My usual belt axe, shown at right, is about the same shape, the handle is the same length, and I do throw it, but it's harder to work with. Two things cause that. Notice that it has a flat poll, which is great for pounding stakes, breaking rocks, etc. 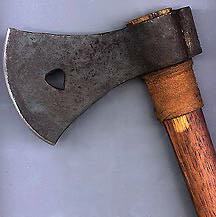 but causes the axe to be less well balanced than the other and heavier by about 3/4 pound. Most people find a straight-grained hickory or ash handle to be best, and both are very durable. Your tomahawk need not be razor sharp for throwing, but the edge should be filed with a fairly thin "V" edge for better penetration in the block. How far do you stand from the target? It depends.... how tall are you? Because the throwing motion you will use depends on the length of your arms, legs and torso, the distance will be the one which fits you , but may fit no one else. You'll have to find that distance by trial and error, but it ain't hard. The average man will find that 5 1/2 normal paces will be a good place to start, with modifications as you become more experienced. Stand with your back touching the block, pace off your distance and turn to face the target. Stand at an angle to the target, turned about 45 degrees to the right for a right handed person. Your left foot will be angled away from the target to the right, and your right, or rear, foot will be angled moreso. Stand with most of your weight on your back foot. The position will seem very familiar to pistol shooters, except it is reversed from the stance used there. What you are looking for is a natural throwing stance, not much different from throwing a rock. Refer to this sequence of photos as you read through the directions in order to visualize what you need to do. 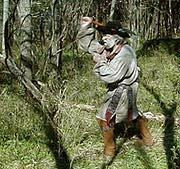 I like to hold the tomahawk at the end of the handle with my right hand, blade toward the ground, and cradle the handle behind the hawk head in my left. Rock back so that even more of your weight is on your rear foot, at the same time letting the tomahawk swing first down toward your right knee and then back up over your right shoulder. Don't exaggerate, what you are looking for is just a normal, comfortable throwing motion. 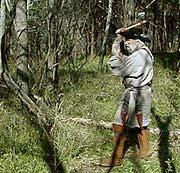 When the axe reaches the back of its swing over your shoulder, simply throw it. Look at the target with all the concentration possible ---THINK IT INTO THE TARGET---, forget everything else, and just throw it. You will find that as you do this you will just naturally shift your body weight forward, and that it will seem right to take about a half-step, or so, toward the target with your left, or front, foot. Your rear foot may follow just a bit, but should usually just drag a few inches on the ground. The second most troublesome error is to throw the hawk too hard. Throw it with only a little more force than is needed to easily reach the target. You'll have to learn that if you ever expect to attain consistent accuracy. You can, with practice, cut a playing card many times in a row when you are throwing well, but not if you are trying to chop down the block. As with so many other sports, follow-through is critical, and you'll do much better if you insist on having a good one. Your throwing hand should wind up in front of your left thigh and extended a bit. Now, practice a lot and think about what is happening. It will come together quicker than you might think. The only non-standard throw I've ever tried is to make the hawk stick handle up instead of down, as it normally does. 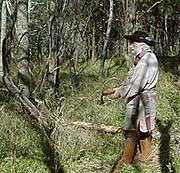 That involves finding a new distance, usually about two paces farther from the block and also throwing the hawk with the blade pointed backward over your shoulder, instead of forward. Try it, you may be an undiscovered world champion. Copyright © B. E. Spencer 2001 All rights reserved.